Microservers have emerged as an option for specific classes of workloads that tend to scale well with large numbers of relatively lightweight nodes. Intel supports this topology with a broad range of processor offerings engineered to give flexibility of choice, improve node density, and reduce node power consumption. This paper introduces the... design concepts behind microservers and gives decision makers the background to make informed decisions about whether microservers can help them address their server infrastructure needs. The paper explains the context in which microservers have evolved and the characteristics of the new design modality. It offers guidelines for identifying whether workloads are well suited to micro server deployments. The paper also provides an overview of Intel® platforms associated with the micro server option and explains how that hardware fits within the framework of industry standards and product offerings. As the computing industry innovates, new applications and software models are emerging rapidly—particularly those in the Internet data center. For example, the web tier has grown to become a large portion of the server infrastructure in many Internet data centers, handling content for millions of users. Highly parallelized workloads such as analytics and non-relational databases are becoming more widespread. And a host of new content delivery services are driving different ways to store and distribute digital content. While the majority of emerging Internet workloads requires high performance systems to handle dynamic, complex tasks, a subset places lower demands on server infrastructure. These lightweight applications don’t take full advantage of mainstream server platforms that are richly configured with memory, disk, and networking options typically found in enterprise data centers today. Microservers are an emerging category of system designs that have been created to address lightweight applications and simultaneously improve data center efficiency. 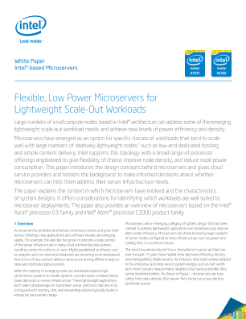 Read the full Flexible Scale-Out with Lightweight Microserver white paper.